Vintage Norton Motorcycles: The Beecroft bike! -SG- The late Ron Beecroft's 1929 CS1 has appeared on the website before. In Ron's hands, it was a force to be reckoned with in Vintage sprints and is probably best known for an over 90 mph terminal speed at Brighton Speed Trials in the early fifties. Getting on for seventeen years back now, the bike and a spare engine (actually Ron's tuned sprint power unit) were sold through Verralls and the new owners in due course disposed of the sprint engine and built up the bike into a basically touring 1929 model . This, in turn, has changed hands a couple of times and the new owner, Neil, has recently been in touch. He reports that the file of documents he received with the bike shows Ron seemingly acquired the bike in 1948 or thereabouts but did not tax it for road use after 1950. Included in the file were a couple of excerpts from the VMCC Bulletin (this was before the days of the actual Magazine!) and the texts - one being a brief write-up by Titch Allen from 1948 and the other Ron's tuning notes from 1951 - are below. Thanks Neil! A “cammy” owner usually has already some experience of motorcycles. If he is more or less a “First Year Man,” it would be wiser to start with some other type but, perhaps, not a two-stroke. There are on sale good handbooks on “Tuning for Speed;” the home tuner will find one of these of immense help as they are written by competent authors. These notes, then, must only be regarded as a possible help to those liable to make, in the future, the mistakes the writer has committed in the past. Using ordinary handwork tools, most jobs can be managed if care, patience and cleanliness are used, except possibly the task of lining-up flywheels. The choice of event one intends entering governs the machine’s preparation and for sprints and short distance work generally, especially when transport for the bike can be used, an alcohol fuel and stripped racing trim will be the set-up for success. The engine will have to be fitted with a new piston, giving a compression ratio of at least 10 to 1 and other work carried out, if the most is to be gained from the potentially greatly increased power over that with a standard motor on petrol. 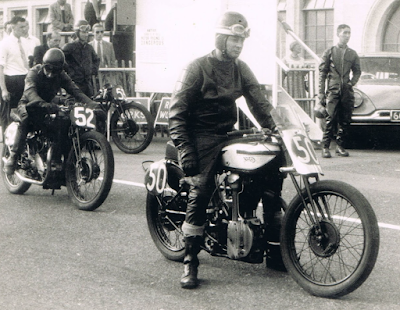 This work is to make quite sure of the reliability for, to resort to history, the CS1 power unit of 1927 to 1930 was designed in the NORTON tradition by Walter Moore (who is also notable for introducing the pivot-mounted gearbox, patented in 1925.) It was designed as a petrol-benzole engine and “swept the board” for a period in the ‘Island’ and elsewhere before being completely redesigned at the close of 1930. It is not too hard to guess that there were reasons for this alteration. One finds them first hand. The vertical-shaft bearings and main bearings must be in sound condition if the bevels are to endure. This may mean new bearings, but I have simply fitted new 9/32” balls into the self aligning – Hoffman races where they are not too badly worn or pitted. The crankshaft and flywheels must not have endfloat that can be noticed when the crankcase is bolted up, or the depth or MESH of the “bottom bevels” will be affected. These bevels must engage deeply; they are only too anxious to come out of mesh and destroy themselves and most of the engine too, if care to get this part right is not taken. If the adjustment to get the flywheels central in the crankcase has been done by a number of shims on the drive side mainshaft, it is safer to remove them, measure their combined thickness and get or make a shim or shims, to go behind the drive side main race, which will have to be removed from its housing – unshrunk – for this shim, which can be of ordinary steel, to be inserted. Nothing must be left that might vary the mesh of gear teeth under load. Engine bolts holding the crankcase halves together must be good. The 1927 engines had no dowels at the back of the cage or housing of the lower vertical bevel. If yours is one of these, a single dowel or even projecting screw locating in the crankcase wall will pay dividends. Those engines suffer from fractured guide cages to the oil pump plunger pin. The pin fits snugly between the bronze faces, if not, the pin is worn or a guide from a 1928 or later model is needed (later plunger guides being much sturdier.) The oil pump is not brilliant and needs full motion and unrestricted passages. While the engine is down it will help if the port joining the bevel-panel with the trough below the flywheels is filed, and cleaned up, also a larger return oil pipe to the tank is worthwhile. The standard arrangement for holding the cylinder head down fails under the high gas pressures of dope and H/C ratios. The studs should be removed and replaced by a set of the later kind that screw directly into the crankcase for this fuel. If alcohol ratios are used, the con-rod, with ⅝” piston pin is doubtful, and cracked gudgeon bosses can be anticipated. A rod with ⅞” small-end is desirable. Keep the original cams and timing. Strong valve springs are unnecessary, and likely to offset any gain in performance at high r.p.m. by causing flexing of the rocker-box platform, reducing valve lift and increasing stress on O.H.C. gear generally. Modern valve spring collars are too heavy and may rub against the cambox endplate. Valves and guides for the current NORTON ES2 models are very slightly larger in the head and body diameter respectively and make useful replacements, but something seems wrong with the steels when used as an exhaust valve, and the writer uses old tulip valves. Much could be written on this but it will suffice here to state that for sprints turn the metering tap full on and the sump level adjust to lowest number. Longer events, put level adjuster at “high.” Castrol “R” is recommended, or any event on Dope, but used methanol for touring and experimenting during petrol “black out” on a 13 to 1 C/R with mineral oil. Be sure the oil pump driving worm is screwed (L.H. thread) tightly home as it has been known to break through the timing cover panel during a backfire! The original Binks gives results! Guard against too much advance, ⅝” B.T.D.C. is ample with petrol mixtures. A KLG M.80 Plug (5/-) works well. There is little to object in polishing the insides of the motor if your clutch is going to slip in the race, or the oil delivery pipe comes detached. Attention to details of the bicycle parts seems to be even more necessary on vintage jobs now they have reached their majority.